So far Kristine James has created 36 blog entries. 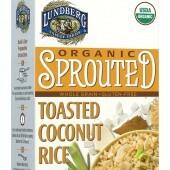 Lunberg introduced Organic Sprouted Rice & Seasoning Mixes that combine organic sprouted brown rice with seasoning in five flavors: Thai Red Curry, Toasted Coconut, Chile Verde, Korean BBQ and Vegetable Fried Rice. 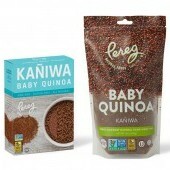 Each is non-GMO verified, gluten-free, vegan and kosher. A serving contains 200 to 210 calories, 1.5 grams saturated fat (of 2 to 2.5 grams total), 440 to 480 milligrams sodium and 4 to 5 grams protein. Vegetable Fried Rice, Korean BBQ Rice and Thai Red Curry Rice are good to excellent sources of vitamin A and vitamin C; Thai Red Curry is also a good source of iron. 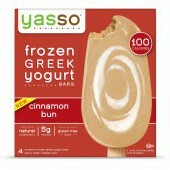 Yasso introduced three new flavors of their frozen Greek yogurt bars: chocolate chip, cookies n' cream and cinnamon bun made from Greek yogurt. 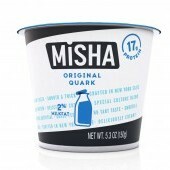 They contain 1 to 6 grams less total fat per serving than other frozen Greek yogurts. Each bar contains 100 calories, 0.5 to 1.5 grams saturated fat (of 1 to 2 grams total), 40 to 60 milligrams sodium, 5 grams protein and is a good source of calcium with 15% of what's recommended daily Kristine James, intern at Bite of the Best: These delicious bars that my whole family loves are 5 to 8 grams lower in sugar per serving than other frozen Greek yogurts. 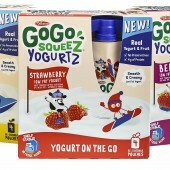 The yogurt and fruit combo GoGo squeeZ YogurtZ come in a re-sealable pouch in banana, strawberry and berry flavors not needing refrigeration. 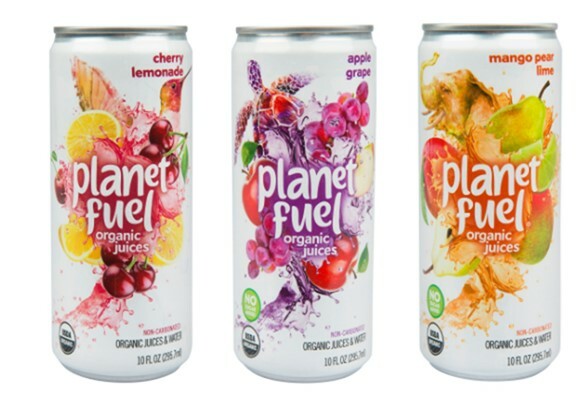 They are kosher certified without preservatives, artificial growth hormones (rBST) or the use of antibiotics. Each 3-ounce serving contains 90 calories, 1.2 grams saturated fat (of 1.5 grams total), 55 milligrams sodium and 4 grams protein, and are a good source of calcium and vitamin D with 15% of what's recommended daily. 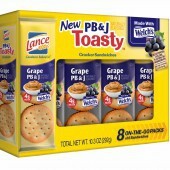 Lance PB&J Grape Toasty Cracker Sandwiches are made with real peanut butter and Welch's grape jelly, without artificial flavors, colors or ingredients. Each 6-cracker package contains 190 calories, 2 grams saturated fat (of 9 grams total), 180 milligrams sodium and 4 grams protein. 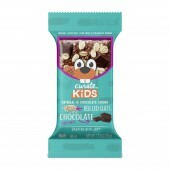 Kristine James, intern at Bite of the Best: My daughter loves these, making a great addition to her lunch box. The combination of protein and fat satiate without a lot of calories and the jelly adds a little sweet with only 4 grams of sugar per serving. 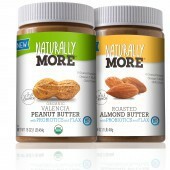 Naturally More introduced a new line of nut butters: Organic Valencia Peanut Butter, Roasted Almond Butter and Chocolate Hazelnut Spread with added flaxseed and boosted with probiotics to support digestive health and immune functions. The nut butters are available in both jars and pouches. Each 2-tablespoon serving contains 180 to 190 calories, 1 to 2 grams saturated fat (of 14 to 17 grams total), 60 to 95 milligrams sodium, 5 to 8 grams protein and is a good source of fiber with 3 to 4 grams. 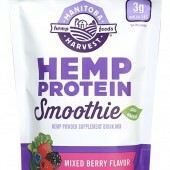 Hemp Protein Smoothie is a powder containing hemp protein, organic coconut sugar and an organic harvest green blend of spinach, kale and broccoli. It's available as Mixed Berry, Vanilla Chai and Chocolate, each non GMO verified. Each 1/4-cup serving contains 130 calories, 3.5 grams total fat and 15 grams protein, is a good source of vitamin A and iron and contains omega 3 and omega 6 fatty acids, essential for good health. Kristine James, intern at Bite of the Best: With only four ingredients high in protein, these make a good smoothie for breakfast on the run or to fuel up after a workout. 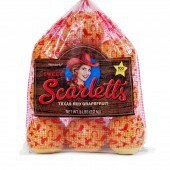 Wonderful Sweet Scarletts red grapefruits, grown in Texas, are sweeter and not as acidic as regular ones. They are non-GMO verified. A half medium sized grapefruit contains 60 calories, 2 grams fiber and contains 100% of the daily recommended amount of vitamin C. It is also an excellent source of vitamin A with 35% of the daily recommended intake. Kristine James, intern at Bite of the Best: Sweet Scarletts taste sweeter and not as bitter as other varieties. 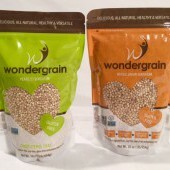 Nature2Kitchen introduced Wondergrain, sorghum, an ancient high-fiber, high-protein, gluten-free grain. It is non-GMO verified that's available as whole grain or pearled (partially de-hulled to soften grain for faster cooking). 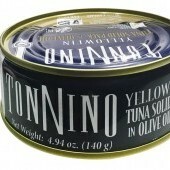 Each 1/4-cup serving contains 160 to 180 calories, 0 grams saturated fat (of 0 to 1.5 grams total) and 4 to 5 grams protein. 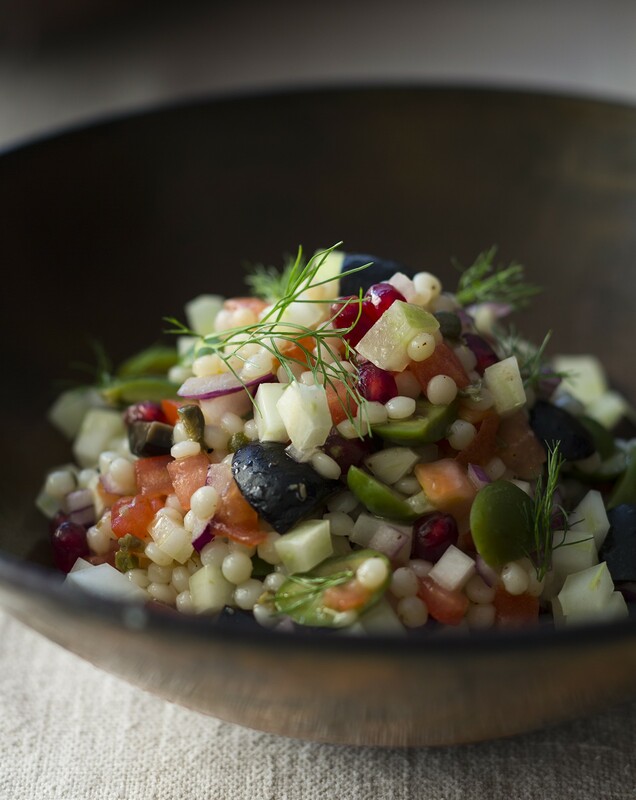 The whole grain sorghum is an excellent source of fiber with 5 g per serving. The Mastrad Express Whisk is a up-and-down rotary whisk with flexible wire tines that can be transformed into a slim cup whisk, a balloon whisk or a flat whisk allowing you to reach all the corners of the bowl. 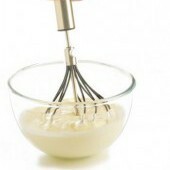 The whisk is available in black or stainless steel. 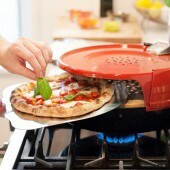 The Pizzeria Pronto Stovetop Pizza Oven is a compact and easy-to-store oven for cooking pizzas on a gas range. The quick-heating oven heats up to 600ºF in 15 minutes, which is evident on the built in thermometer. One 12-inch pizza cooked on its baking stone will be ready in 6 minutes. 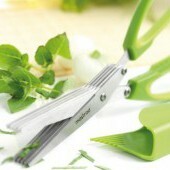 The Mastrad Five Blade Herb Scissors has five blades for cutting herbs or soft lettuces evenly and quickly. 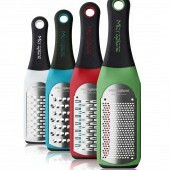 An herb stripper is included in the handle as is a magnet so it can hang on a metal appliance for easy accessibility. 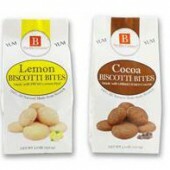 Biscotti Bites are round, bite size and twice baked biscotti available in almond, lemon and cocoa flavor. The bites contain only natural non-GMO ingredients without added preservatives or additives. Each 10-piece serving contains 120 calories, 2.5 to 3 grams saturated fat (of 4.5 to 5 grams total), 9 grams sugar and 2 grams protein. 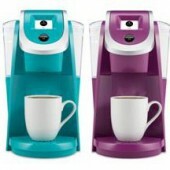 Kristine James, intern at Bite of the Best: I love the fact that each variety only contains 7 to 8 ingredients and adds a little something sweet with your coffee without much added sugar.